Like most tree ferns, the Bird's Nest is popular and pilfered. It is also known as the Crows Nest Fern. 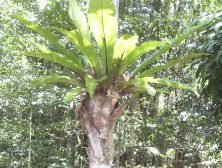 It grows in a great variety of sites in rainforests as an epiphyte on large trees or independently growing on the forest floor and rocks if good light is available. It is found in Queensland, New South Wales to the south coast, and Asia. In southern Queensland and New South Wales the fern is generally larger than in northern Queensland, and there are suggestions that this smaller fern may be a different species. It is well adapted to the sometimes harsh conditions of the rainforest and recovers quickly with the assistance of rain even though the leaves may look wilted, brown and beyond repair. Reproduction is achieved through sporing. The sori are located at the midrib of the frond. Fronds can reach two metres long and twenty centimetres wide, but, in North Queensland, fronds grow less than one metre long, thus suggesting the presence of an independent species. The nest shaped radiating fronds catch dead leaves and other rainforest litter which is caught as the leaves bend outward with age. The litter rots and forms a growing medium for the root system of the fern and other epiphytes. The root system is small, considering the size of the fern, but it is dense and spongy and is covered with persistent brown root hairs. It may be confused with Asplenium nidus. Its genus contains about 650 species, 26 of them in Australia. It is excellent for growing in a pot, tub or basket (due to its small root system), but is also suitable for culture in the ground. It dislikes being in full shade and wet soil and prefers filtered sunlight and a dry situation such as under eaves or large gums for example. Particularly due to its tussock of radiating fronds, it is very popular in cultivation throughout the world. The 'Bird's Nest Fern', Asplenium nidus and/or Asplenium australasicum grow on both rocks and other plants. They can grow quite large and are usually nicely shaped like a bucket to catch a rain and falling debris which decomposes and provides nutrients. They can be seen everywhere in the rainforest and mangrove canopy at Mossman and Cape Tribulation.